Today’s guest post was written by Heitor Ernandes, a PhD student in the Universidade de São Paulo. He is currently doing research about chemical enrichment and nucleosynthesis in the Milky Way with a particular interest in the Galactic Bulge and globular clusters. In his free time usually he likes to play rugby and run. Figure 1. 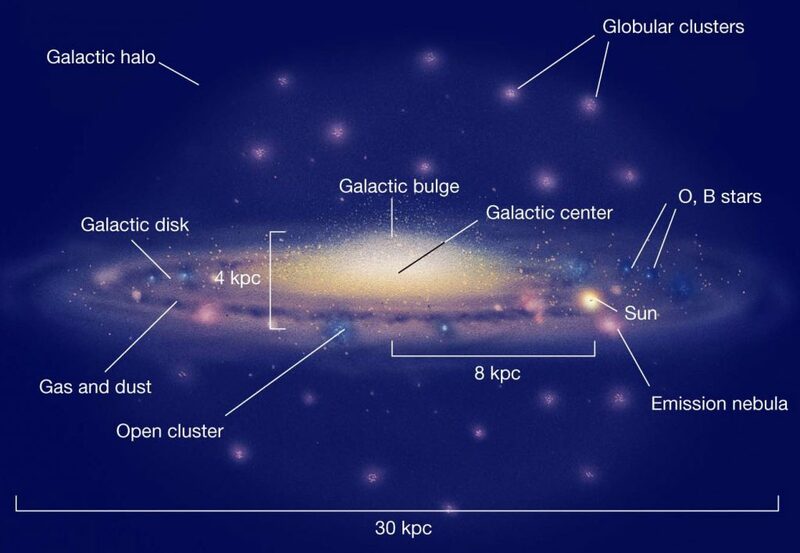 Galactic structure of a spiral galaxy, similar to the MW Credit: Pearson Education Inc.
Globular clusters consist of around 10,000 to 10,000,000 (Omega Cen) stars, which are tightly bound by gravity. Their structure makes us expect that they were born in a single star formation event (not entirely true though, they can show multiple stellar populations). This means that a globular cluster would have formed from a single gas cloud at the same time in the early Universe in the highest density peaks. Globular clusters can be generally separated in two groups—the blue and the red clusters—with regard to their color and metallicity. The blue clusters are usually located in the halo, the most external part of the galaxy where the clusters show no sign of rotation. They are metal-poor with [Fe/H] ~ -1.5, which indicates the stars have less metals than the Sun ([Fe/H]=0). The red clusters are more metal-rich than the blue ones with [Fe/H] ~ -0.5, and in the Milky Way (MW) these clusters rotate with the host galaxy. Such bimodality indicates two distinct formation mechanisms for globular clusters. It is proposed that the blue clusters form in galaxies in the early Universe at high redshifts (z) while the red clusters are formed in situ through merging mechanisms. Wet mergers (mergers with gas) in particular may occur in a starburst in the host galaxy, and they are concentrated in the central parts of the galaxy. This scenario fits well with the observations of massive elliptical galaxies but in the case of the MW it faces a few issues. Blue clusters form when the proto-galaxy itself collapses while the red ones form later with the disc (see Figure 1). Cosmological zoom-in simulations (for example, the EAGLE simulation) start from some initial conditions and cosmological constraints to simulate a part of the Universe. By studying the formation of MW-like galaxies in simulations, the formation and evolution of star clusters can be investigated. In this paper, the bimodality of globular clusters is studied. In particular, the differences between these two sub-populations and their evolution are explored in order to get a consistent formation and evolution scenario. In this paper the RAMSES code is used, which is a zoom-in cosmological simulation. A set of parameters and constants are used as input, including the evolution in time and space for a system with a particular resolution. This resolution defines a cell with a set mass of gas or dark matter that throughout the simulation will evolve and form structures, like stars and galaxies. One example in this simulation consists of a dark matter particle mass with 2.1×106☉. A single-age stellar population is formed, with energy, momentum, mass, and heavy elements injected by SNe Type II and Type Ia. The ones formed before 10 Gyr are called globular cluster candidates. Figure 2. Stellar merger tree of Milky Way. Dots mark three earliest detections of a stellar clump. Colours and line widths indicate the stellar mass of the galaxy. Triangles mark major mergers, i.e. mergers with a mass ratio greater than 1:10. The tree is computed at the output frequency of the simulation, i.e. ≈150 Myr (Figure 2 in the paper). With this method a merger tree of the MW is obtained, which is a plot of the time evolution of the MW and its mergers (see Figure 2). The last major mergers (accretion of some body with considerable mass) occurred at z=2 and after that the MW accreted only small objects, possibly the blue clusters. Figure 3 shows the MW Star Formation History (SFH). At high redshifts a dominance of accreted clusters—the blue clusters—is seen, and at low redshift the SFH is dominated by the in situ formation (formed locally), creating the red clusters. With these results, we can see a possible explanation of the bimodality of the globular clusters in MW. The metal-poor blue clusters,originated from low-mass galaxies and were than accreted by the MW. On the other hand, the red metal-rich clusters formed in a galaxy massive enough to retain the enrichment, such as the MW or they were accreted in major merger before z=2. In the large cosmological context these results show how important small and major mergers are to overall galactic evolution, not just in the case of the MW. Figure 3. 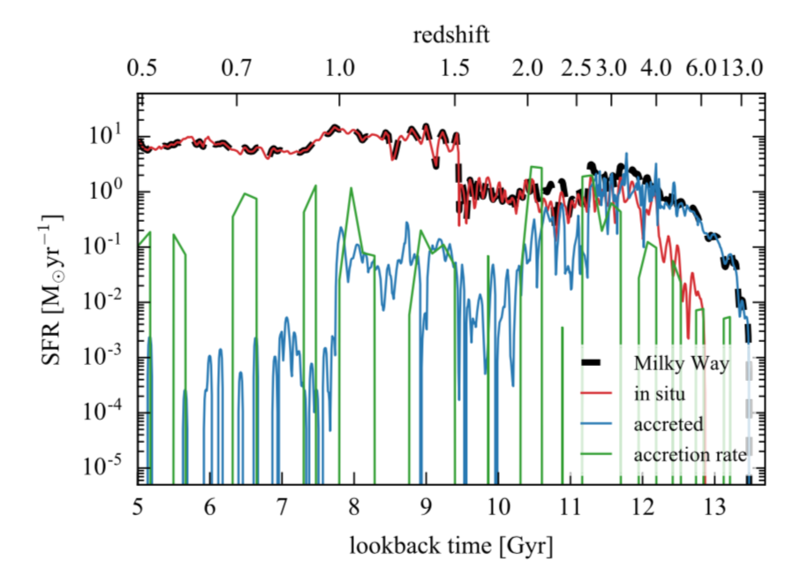 Star formation history (computed as a mass-weighted histogram of formation times of the stars detected in the Milky Way progenitor at z = 0.5, black), distinguishing the stars formed in situ (red) from those accreted (blue). The green curve shows the stellar accretion rate. (Figure 3 in the paper).